Today is one of those days that i’m feeling drained. Any ounce of energy I thought I had has disappeared and me thinks a cold is coming on. It’s one of those colds that is annoying as hell because it won’t make up it’s mind on whether its going to man up and just get on with ruining my week…it’s being a passive aggressive whiny cold that is stuffing me up, making me sneeze and making my head feel like Alfred E Neuman’s because it feels like it’s massive. Le sigh. Since today is World Vegetarian Day and i’m feeling kinda blah, I thought I should share a soup recipe that is sure to chase the blech’s away, beat the living snot out of any cold that is coming on and is easy as hell to make. Plus, it’s vegetarian so it only seems right that I share this with you fine people. First off, I flippin love SOUP! Soup is awesome, there are so many different kinds and now that winter is coming (sorry have to wait a bit longer for game of thrones)…the souptacular season is upon us. This soup is a little bit of comfort in a bowl and goes extremely well with some gooey grilled cheese sandwiches! First off, preheat your oven to 400 degrees. Spray a roasting pan or cookie sheet lightly with some olive oil. We are going to use a few really simple ingredients that most people have on hand on a regular basis. 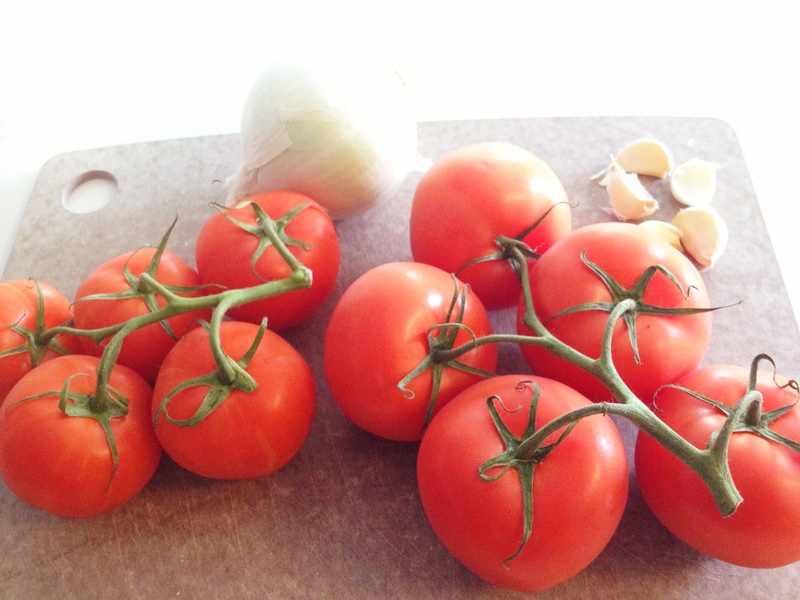 In a seperate bowl (or if you are using a big deep dish roasting pan like me, just use that), combine your tomatoes cut in half, your smashed garlic, onions, salt and pepper, pinch of oregano and half a tsp of smoked paprika. Add a bit of EVOO (Extra Virgin Olive Oil) and mix everything together. *Smoked Paprika is going to give this soup a nice smoky flavour that isn’t over powering but really makes this dish come together. It’s well worth it!! I will try to add more of my recipes that use smoked paprika so you can justify buying it if you don’t already have some. We are in this together team!! All dressed up and ready to roast. 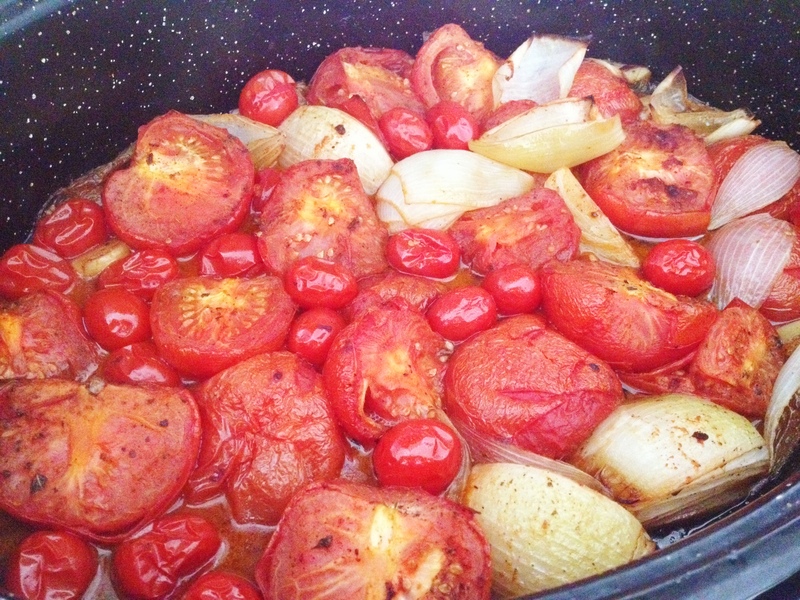 Now place in your oven for about 30-45 min or until the tomatoes are completely cooked and tender. 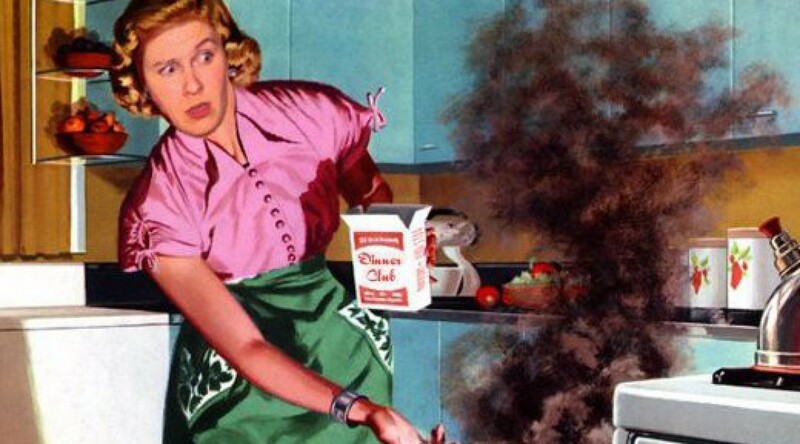 Your kitchen is going to smell awesome, your neighbours will be like “Damn, when did Jamie Oliver move in? ?” Make sure you stir the mixture about half way through. Obviously my head cold is kinda of making me lose the plot a little because at the 30 minute mark, I noticed the half of pint of cherry tomatoes I was also going to add. They were on the cusp of needing to be eaten within a few days time so I had all intentions of throwing them in the roaster as well. Noticing this mistake well in to the cooking process…i decided to throw them in anyway and just cook everything together a little longer so I did this for about 15 minutes more roasting time. Let the tomatoes cool for a bit. Safety first here people cuz these little flavour bombs will mess you up in you decide to stick a fork in them. 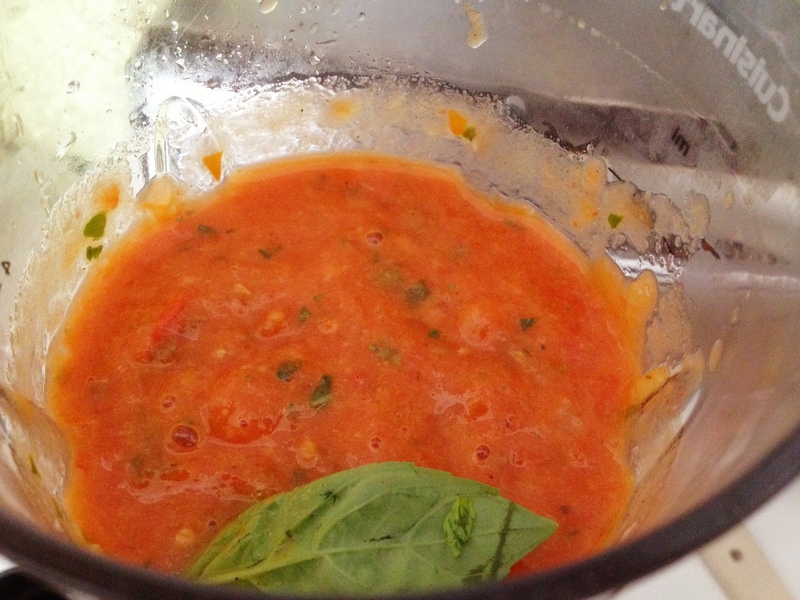 After the mixture has cooled slightly, you can add them to a blender with about a 1/3 of a cup of fresh basil and blend together. 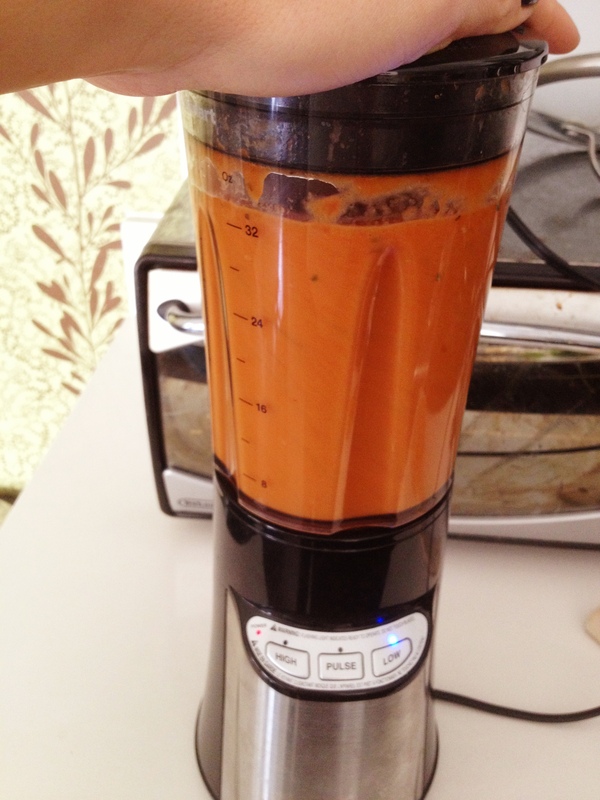 I just used my handy little cuisinart bullet blender with a larger blender attachment, it’s no vitamix but it did the trick. Santa…I hope you are reading this buddy…we all know a vitamix would fit on your sleigh and you are probably tired of milk and cookies by now so just stop in for a smoothie k? View from inside the blender. There was a basil leaf stuck to the lid…ha ha, he thought he got away. Look at this gorgeous bowl of soup! Pair that with some of my next level grilled cheese…you pretty much showed that cold who’s boss…not Tony Danza…YOU!! 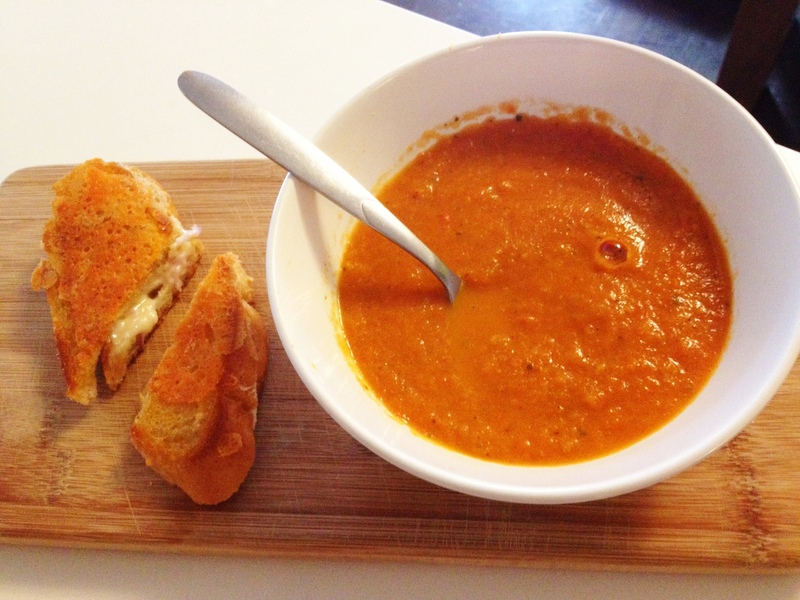 Bowl of Comfort with next level grilled cheese…whaaat??? 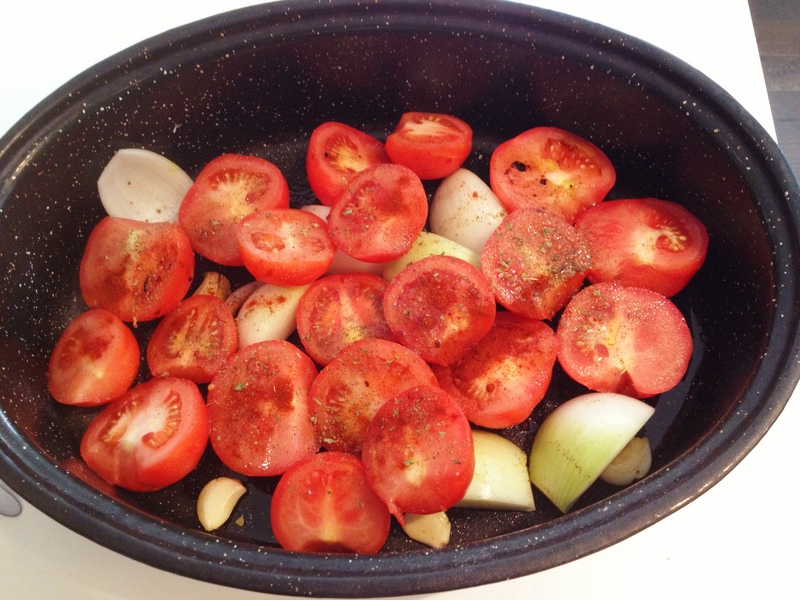 Place your tomatoes, garlic, onions, salt, pepper, smoked paprika, pinch of dried oregano and evoo in a bowl (or use the roasting pan if it’s deep) and toss around until all ingredients are mixed together. Spread on to a pan if using a different one. 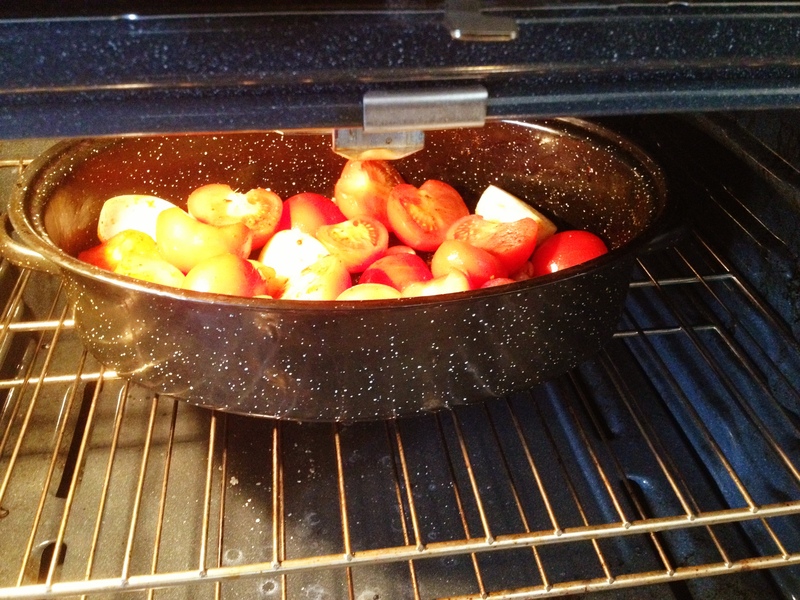 Roast in the oven for 30-45 minutes or until tomatoes are tender. Remove the mixture from the oven and let it cool for a bit. 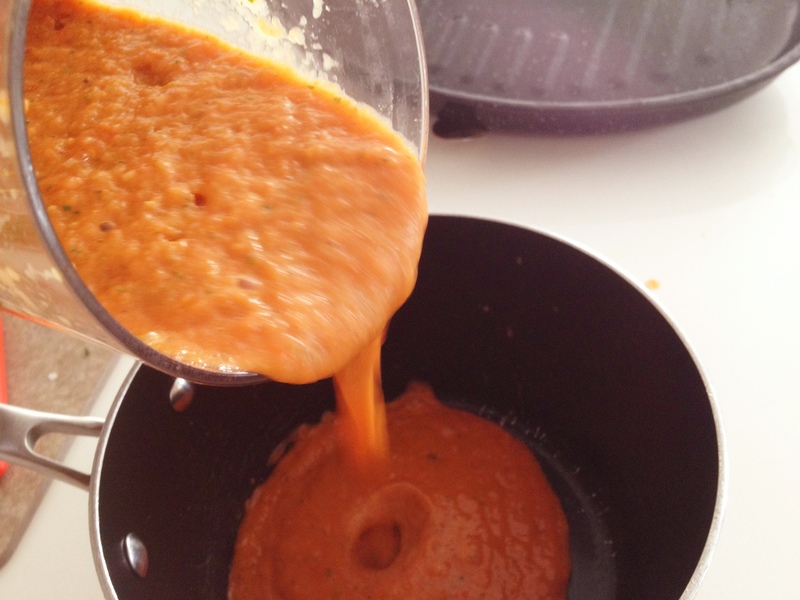 Pour in to a soup pot and reheat. Serve with grilled cheese or fresh bread and you’ve got yourself a winner!!! Thanks @Carolyn De Blieck!! 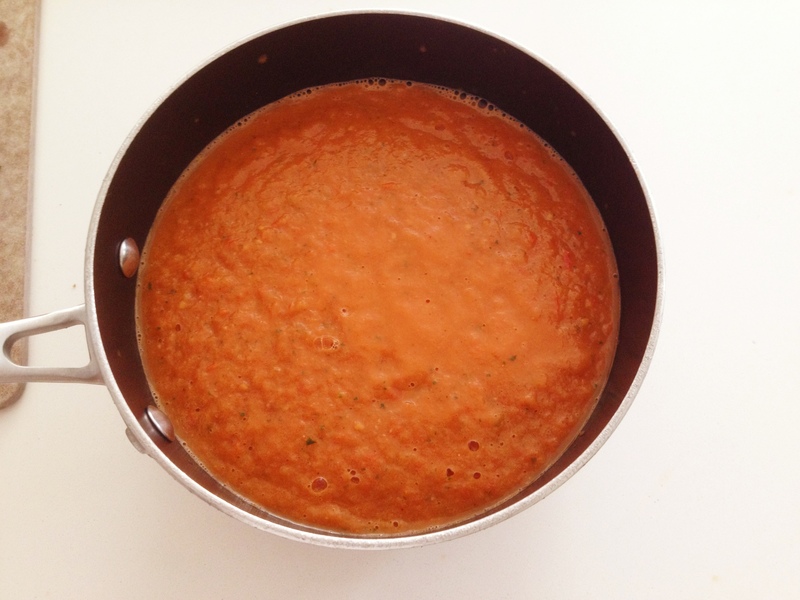 Mo’s red pepper soup sounds awesome!! Thanks for checking out my site @icookandcode Appreciate your feedback. I will have to check out your blog as well. Keep checking out my moody little recipes and feel free to follow me on instagram.